Known in herbal medicine as “stinging nettle,” “Urtica Urens” is a solid homeopathic remedy that is quite useful for issues of the skin. Burns? Hives? Bites? Stings? This remedy could be the right one for you. Urtica grows wild all over the world, enjoying a temperate climate. The plant is covered in tiny hairs that are sharp and can pierce the skin of a passing creature. Long ago, in ancient Greece, physicians used Urtica to treat wounds, nosebleeds, and other conditions where blood was present. 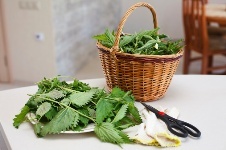 In Europe, nettle is eaten as a vegetable or cooked in a soup to tonify the blood. It enjoys a lengthy history of use for many ailments in Western herbal medicine, and remains valuable today. The homeopathic remedy is made from the flowering plant, chopped up and pulped, then doused in alcohol. As you’ll see, it’s used principally for topical problems. What does it treat best? 1. Burns: These are burns of the minor category. Urtica can relieve the stinging pain (get it, “stinging?”) of burns and scalds. 2. Hives: Urtica is good for a rash that itches, stings, and/or burns. It may present with joint pain. The blotches are red and raised, and you have a desire to constantly rub them. You feel better for rubbing and worse for heat, exercise, and nighttime. It could be a flare-up of some condition, or a reaction to eating something. It may also involve prickly heat felt in the area. 3. Bites, stings: This comprises virtually any bite or sting with itching and some pain. Who will Urtica treat best? Urtica doesn’t have strong related symptoms, but yet is a good remedy to include in your first-aid kit. Basically, physical symptoms include burning, stinging, and swelling on the skin. You feel better for rubbing the affected area, and worse for cool air and bathing in cool water. First-aid situations are where homeopathy works some of its best magic. Issues like a minor burn or an itchy rash were tailor-made for this more modern form of alternative medicine.